The BalusC Code: First book dedicated to OmniFaces now available! I'm proud to share with you that the first book dedicated to OmniFaces is finally available as of today! 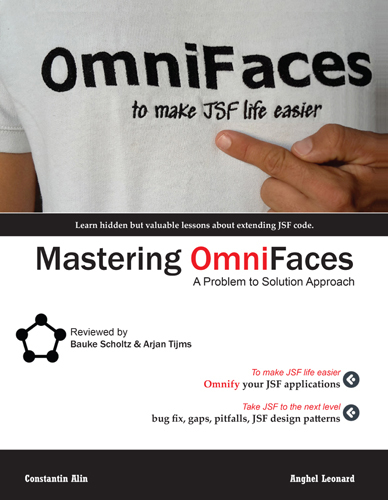 Mastering OmniFaces is since October 5, 2015 available at Amazon.com! This book was created in cooperation with me and Arjan Tijms. From the beginning on, we worked together with Anghel Leonard and Constantin Alin to get this book ready, and we have reviewed it from top to bottom. A little over 500 pages, this book goes into depth identifying general JSF problems and describing how OmniFaces has solved it, hereby uncovering several patterns and tricks. Basically, the working of every OmniFaces component, taghandler, converter, validator, and several handlers and listeners is break down in the book in a problem-to-solution approach. Reading this book is a true learning exercise as to exploiting JSF API, creating custom components, renderers, tagfiles and what not provided by JSF API in order to solve common problems. A must read if you also like Mastering JSF 2.2 from the same author!